Any concerns or need help? Call (805) 419-0226. Super easy to use DNC software. 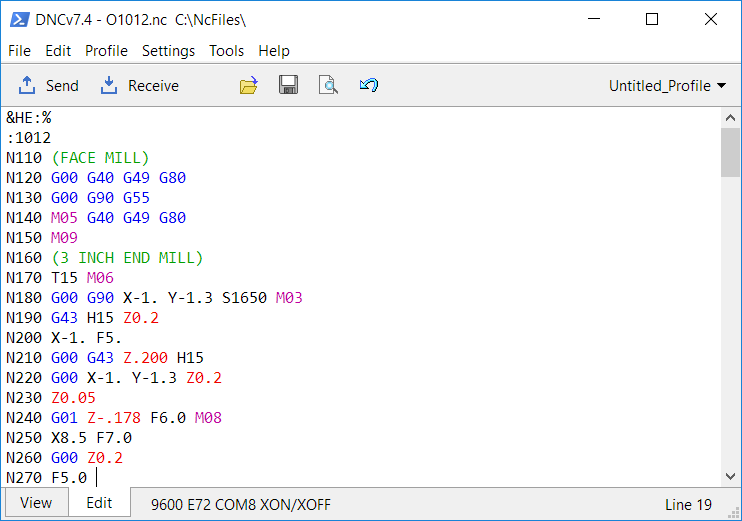 Completely rewritten to meet Windows 10 64-bit design requirements (backwards compatible with Windows 7/8). Works with the RS232 interface of most CNC controls and similar devices. Is the best DNC software for use with Haas machine tools. *Contact us to confirm support for a specific series/model. At least one physical COM port; native serial, USB serial adapter, or Serial-over-IP. RS232 cables must be of null-modem configuration, shielded, and grounded. Internet access is recommended, but not required. All information submitted to dncsoftware.com is used only to fulfill requested service. No information is used for unsolicited sales or shared with third parties except credit card processors. Online purchases are processed by PayPal, see paypal.com for their privacy policies. Credit card numbers are not stored on any dncsoftware.com server. PayPal account is not required to make a purchase, phone orders, purchase orders, and checks are accepted. Submission of PC metadata (MAC, etcetera) and email address is required to activate software. This website is intended for people who are at least 16 years of age. Haas CNC, Haas Automation, Haas are trademarks of Haas Automation, Inc.
Microsoft, Windows, are trademarks of Microsoft. All other trademarks cited on this website are the property of their respective owners. dncsoftware.com develops its own software and is not a software reseller. DNCv8 software is sold from this website only, resellers are not authorized. Sihler Engineering / dncsoftware.com is in no way affiliated with any other company or entity. Hours of operation: Please call anytime, we try to answer at all hours. NOTICE: This website is not intended for use from the EU.